The Crease brush will create a polygon slice along the drawn curve, with a crease assigned to it. This is done without adding extra PolyGroups. As with most brushes, it’s possible to change from the default (Curve) Stroke type to Circle, Lasso, Rectangle and more. This allows you to create different shapes when creasing. The Crease brush is selected by holding the Ctrl+Shift key, then pressing the Brush icon to select the Crease brush. 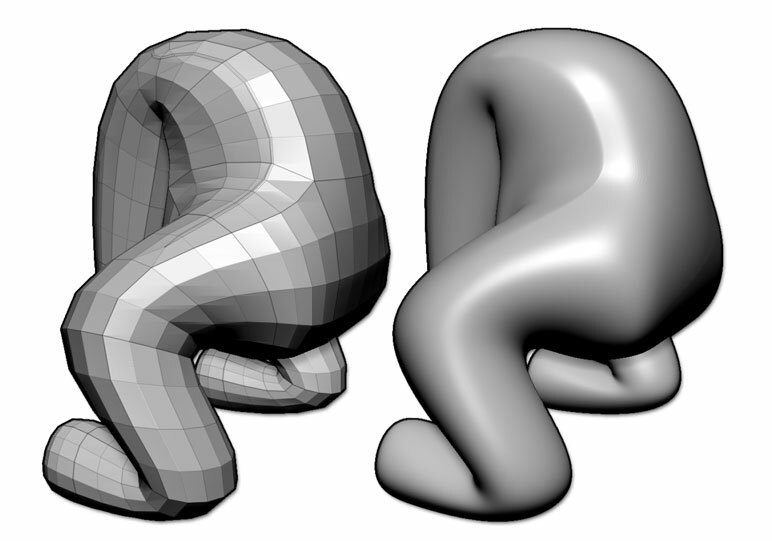 This brush will only work on models without multiple subdivision levels. The Crease Brush was used on this mesh. The left and right images show the model before and after dividing it so that you can notice the creasing. Activating the Brush >> Clip Brush Modifiers >> Brush Radius (BRadius) option will use the Draw Size (the brush radius) to create a double line with a crease on both curves.